Potentially the biggest upheaval ever for Web Designers worldwide, Google's recent announcement that the mobile friendliness of websites will, from 21st April, be a ranking factor in search engine results for mobiles forces a complete rethink of the way in which websites are built. Previously there was a big shift in working practices when designers were encouraged to create sites where the layout and structure was coded into the CSS stylesheet, as opposed to being built into the HTML page using tables to place content on the page. However there are many old sites out there built with this outdated technology that are dominating the search engine results in spite of their shortcomings, so this shift has not necessarily been detrimental to rankings up till now. With this latest algorithm change from Google however, this is set to change. Many web designers have already been building mobile friendly websites for some time and this has resulted in a very different look for modern websites: a cleaner, simpler layout is becoming the norm, a refreshing change from the over-fussy highly graphical websites that were popular previously. Advances in web technology mean that stylistic features such as rounded corners, drop shadows and gradient fills, which previously could only be done with graphics, can now be coded in the stylesheet without the need to use images. This has radically changed the way that we work when designing websites. Here at Lakeland Web Design virtually all the websites we have built over the last year have been offered with mobile responsive coding as part of the web design package. Older sites, if they wish to meet Google's mobile friendly criteria, will need an upgrade to conform to Google's requirements and preserve their search engine placement on mobile devices. For more information on our upgrade services, please visit our mobile responsive website design section on this website. If you are one of our customers, and you are not sure if your site is mobile friendly or not, you can check the listings in our portfolio of custom websites or CMS websites where mobile friendly sites have been flagged as such. 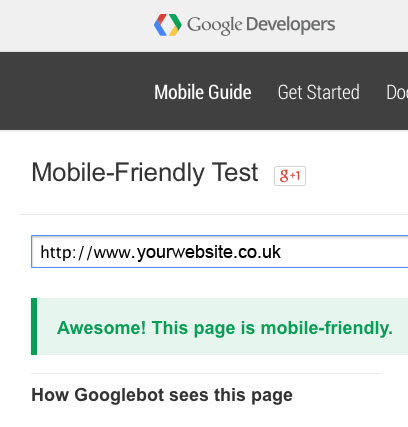 Google has also created a mobile friendly test tool which can be used to evaluate whether your website currently meets the mobile friendly criteria or not. If you do not get the 'Awesome!' result, then your site is in danger of being down-ranked on mobile devices. Orders are now coming in for upgrades from our existing customers and it looks like we will be very busy with upgrades over the next few months.